What does it mean to be photosensitive? How do you know if you have photosensitivity? 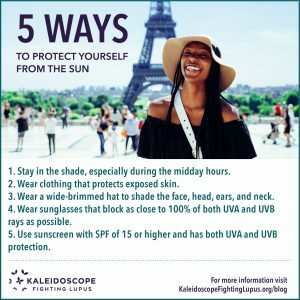 Lupus and Photosensitivity: What can I do to protect myself? Do you feel like the sun is your enemy? Have you noticed that you have flares or feel less than fantastic during warmer sunnier months or with increased sun exposure? Do you get rashes or irritated skin after exposure to the sun? Are you sensitive to fluorescent lighting? Have you been diagnosed with lupus? Rashes may develop across the nose and cheeks after sun exposure; this is known as the butterfly rash, commonly afflicting those with lupus. For more information on rashes and lupus, please read our blog on the topic of Lupus Rashes. Sun exposure may actually cause a lupus flare, resulting in fever, joint pain, and more serious organ inflammation. This type of reaction makes being “sun smart” necessary when you have lupus. Photosensitivity can be confirmed by photo-tests. Artificial light from varied sources is shone on small areas of the skin to see if the rash can be reproduced or if a sunburn occurs more easily than expected. When the weather is nice and the weekend has arrived, outdoors tends to call to us (as long as we are feeling well enough), right? Summertime or sunny time means barbecues, beach trips, picnics, hikes, bike rides, lounging in the backyard, gardening, etc. We want to spend time with our family and friends doing fun things and not feel left out, but being photosensitive may make us rethink our decision to join in outdoor activities. For those who have photosensitivity and live in a year-round sunny climate, this may be a 365 day dilemma. Does having photosensitivity mean that you cannot do these things at all? Of course not. There are ways to be smart about your sun exposure, “sun smart”, if you will. The facts are clear, regardless of whether you are photosensitive or not: research shows that too much UV radiation can cause sunburns which can lead to skin cancer, some of which can be deadly. These UV rays can also damage your skin, causing wrinkles and premature aging. If you are photosensitive, these are real concerns in addition to the flares and rashes. The best rule is to avoid midday sun between 10am and 4pm. Even if the day is overcast, those powerful UV rays are not all filtered out by cloud cover. Wear sunscreen with at least an SPF (Sun Protection Factor) 30 that blocks both UVA and UVB rays. Be liberal with your sunscreen application as it takes around one ounce to cover your entire body. Sweating, swimming, and clothing can all remove sunscreen so be vigilant about re-applying regularly and don’t forget the back of your neck, ears, and scalp! Wear clothing that covers exposed skin. Long shirts and pants in lightweight, loose fitting, fabrics can keep your skin protected and keep you cooler! A wide brimmed hat is also a must have for those with photosensitivity. Please share this blog and help remind others how to be sun smart!